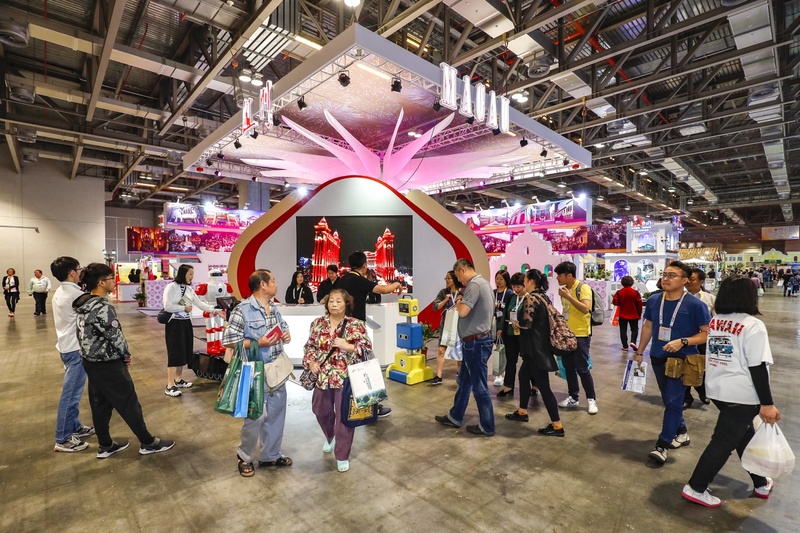 Organized by Macao Government Tourism Office (MGTO) and coordinated by Macau Travel Agency Association, the 6th Macao International Travel (Industry) Expo (referred to as the “Expo” or “MITE”) culminated in success on 29 April. The exhibition boasts a wider area, accommodating more booths and exhibitors from a greater number of countries and regions. A total of 40,120 visitors and 305 industry buyers were attracted to the event, where 38 agreements were signed in total. In sum, the Expo highlighted the strengths of Macao as a Sino-Portuguese platform and a major hub along the Maritime Silk Road, as well as its role in facilitating cooperation across the Guangdong-Hong Kong-Macao Bay Area, with a yield of satisfactory results. During the Expo, Secretary for Social Affairs and Culture of the Macao Special Administrative Region Government, Alexis Tam, made an inspection visit to various exhibit booths on 28 April and encouraged exhibitors to help promote the cultural and creative industries and the culinary diversity offered by Macao as a Creative City of Gastronomy, by showcasing the new dynamic of tourism, culture, creativity and gastronomy woven together. The Expo was staged at Hall D, Cotai Expo of the Venetian Macao from 27 to 29 April. The exhibition was expanded to an area of 11,000 square meters and featured 550 booths in total. Exhibitors include a total of 420 travel or tourism-related enterprises and units from 50 countries and regions across Asia, Europe, the Americas, Africa and Oceania. Among the exhibitor units, eleven came from the Guangdong-Hong Kong-Macao Bay Area and 14 of them from countries and regions along the Maritime Silk Road. In addition, eight exhibitor units are Portuguese-speaking countries and 23 of them are tourism bodies of Mainland provinces and municipalities. Held for the sixth year, the event presented five key highlights, namely China-Portugal Tourism Networking, “Maritime Silk Road” Tourism & Culture Display, Greater Bay Area: Tourism Development and Opportunities Seminar, Macao “Tourism･Creative” Street as well as “Macao: City of Gastronomy” Feature Zone. The three-day Expo drew a total of 40,120 visitors, a rise of 11% from last year, and 305 industry buyers from major visitor source markets. Over 50 journalists arrived to cover the event. Exhibitors rode on the occasion to widen their network of business partners and promote their tourism resources and products to visitors, making the Expo a happening event. 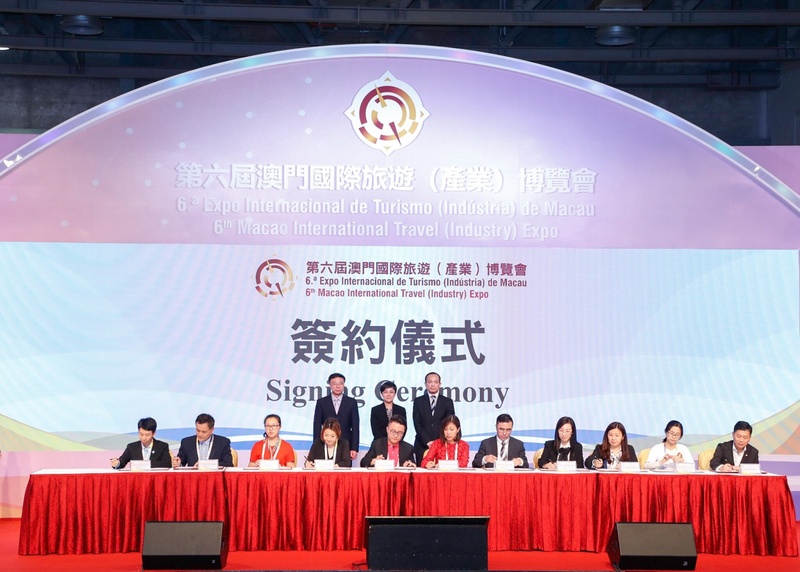 The Expo conducted a series of signing ceremonies that brought together enterprises from tourism and related sectors for 38 agreements signed to push forward business cooperation among industry operators from Macao and other parts of the world. Director General of the Department of Publicity and Culture of the Liaison Office of the Central People's Government in the Macao SAR, Wan Sucheng, Assistant Director General of Economic Affairs Department of the Liaison Office of the Central People's Government in the Macao SAR, Xu Jun, MGTO Director Maria Helena de Senna Fernandes, President of Cultural Affairs Bureau, Mok Ian Ian, and President of Macau Travel Agency Association, Alex Lao, witnessed the signing ceremonies together with other guests. Starting this year, MITE is scheduled in April annually to provide an optimal timing for industry operators to sell their summer packages in advance so as to harvest greater commercial benefits. Many exhibitors expressed their interest in joining the next edition of MITE and some of them are discussing about their booth arrangement for next year. MGTO is hoping to bring more international exhibitors to the event in the future and forge the event into Macao’s signature international travel fair brand. During the Expo, a total of 26 destination presentation seminars and seven trade networking sessions were held. Representatives from the Ministry of Culture and Tourism of the People’s Republic of China, the Asia Tourism Exchange Center, the Liaison Office of the Central People's Government in the Macao SAR and Macao Government Tourism Office attended a series of destination presentation seminars, including the destination presentation of Zhuhai, the cultural tourism and investment presentation of Pizhou, the joint tourism presentation of Shanghai, Hubei and Hainan, as well as “Beautiful China Year of Integrated Tourism 2018” – the themed presentation about Silk Road tourism products, among others. MITE is a major annual event for the international tourism community. The event not only covers six key elements of the tourism industry — dining, lodging, transportation, entertainment, sightseeing and shopping, but also gathers professionals and operators from tourism and other related sectors worldwide, including travel agencies, hotels, touring attractions, transportation as well as other travel-related extended services. MITE is dedicated to forging a platform for industry delegates to exchange perspectives, build partnerships and enjoy a mutual gain from visitor markets, while providing practical travel tips for travel enthusiasts. The co-organizers of the 6th Expo include the Tourism Development Committee (CDT), Macao Chamber of Commerce, Macao Federation of Trade Unions, the General Union of Neighbors Association of Macau, the Women’s General Association of Macau, Association of Returned Overseas Chinese Macau, Travel Industry Council of Macau and Association of Macao Tourist Agents.